Discussion in 'Transformers News and Rumors' started by Fc203, Jan 13, 2019.
point is almost every movie toy has gotten a G1 inspired repaint at some point. Yes, but Studio Series isn't going to have that. You specified Studio Series and as of now it's in full on movie accurate mode, so there's gonna be no purple. And probably no triple changing because that engineering with the movie aesthetic is... yikes. He looks OK for what it is. How is the plastic quality of other nitro figures? Is the plastic ok or they also suffer of cheap hollow plastic syndrome? Very nice! But I'll wait for a proper Voyager mold which will probably look even better! Wrong... Studio Series is not devoid of inaccurate repaints. There are two different gold colored Bumblebee's the 70's Camero and VW Bug... and I question why they don't also have blue robot parts since it makes him look like Goldbug/Goldfire... there's a leader version of Evasion Mode Optimus Prime that also has G1 colors just like the original Voyager but no blue shoulders this time. Non of these ever appear in any movie so that goes against the whole idea of Studio Series not having that when they've already done it. There's also a studio series figure of a character who never existed in the movies who's just a repaint of Lockdown. If they can make toy only characters in the Studio Series line and other non-movie repaints then they can make a G1 inspired repaint of Blitzwing. And I already addressed the engineering issues... though it should be a little easier to work in a third mode when it never actually appeared in the movie. They could give him a cybertronian tank mode... which they pretty much already did... and then they can take a lot more liberties with the tank mode... basically it would look more like an after thought and would probably be the weakest mode but triple changers always have one weak looking mode anyway. "Energon Igniters" is the name of the entire play pattern. The individual price points are named "Speed Series", "Power Series", "Power Plus Series" and "Nitro Series". Anyway ... Blitzscream here doesn't look bad. If it's not made of clearance store plastic, I'll think about it as a big desk toy. That's because those are special limited editions. They were convention exclusives, and people usually make those for conventions and not main line pieces. There's a leader version of Evasion Mode Optimus Prime that also has G1 colors just like the original Voyager but no blue shoulders this time. Isn't that part of the Bumblebee series in Japan and not Studio Series? There's also a studio series figure of a character who never existed in the movies who's just a repaint of Lockdown. Those are the Shadow Raiders. They were in the movies. The orange deco is just an odd outlier in the series. Convention exclusives? I saw one at Game Stop the same day I picked up the yellow version of the VW bug. And where in what movie where there Shadow Raiders? I didn't see them in any of the movies and they aren't listed on the Wiki. Shadow Raider just seems to be a toy only repaint of Lockdown. 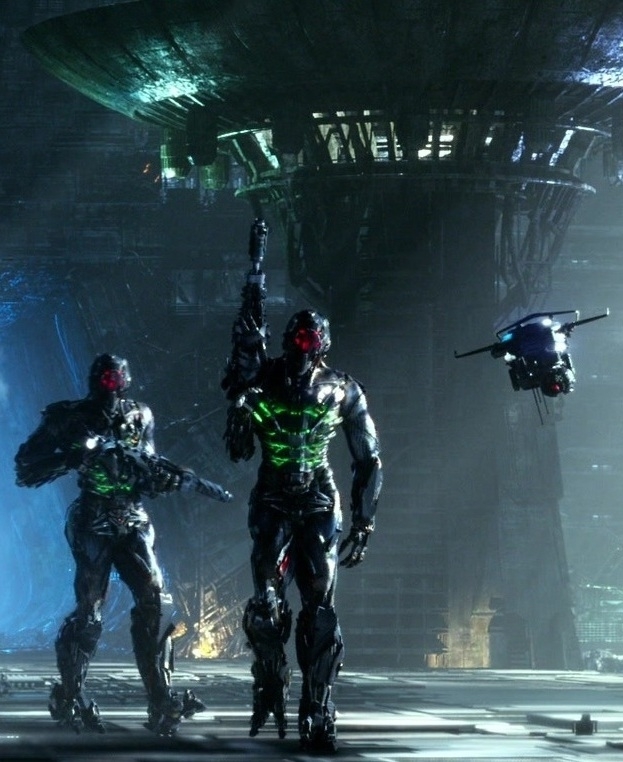 Shadow Raider is supposed to be these guys from Age of Extinction. They were in Lockdown's ship. They never transformed in the film. OK so I was I was wrong but they still aren't screen accurate as you were claiming everything in the Studio Series had to be. They aren't just recolors of Lockdown in the film and those aren't even the correct colors. It looks more like the also inaccurate Hot Rod repaint though with more red than the actual Hot Rod repaint of Lockdown and without the Hot Rod head sculpt. Oh and have I mentioned that all the Dinobots have G1 colored repaints... even the ones who don't actually have G1 counterparts... they made toys for all five of the original Dinobots in the movie aesthetic. Ah, well the Camaro was a con exclusive and the Beetle was a retailer exclusive IIRC. OK so I was I was wrong but they still aren't screen accurate as you were claiming everything in the Studio Series had to be. They aren't just recolors of Lockdown in the film and those aren't even the correct colors. And as I said, they're the odd one out of the bunch. The Shadow Raider may be screen inaccurate but at least they were in the movie. You said they weren't and I corrected you. And as I said, they're the odd one out of the bunch. The Shadow Raider may be screen inaccurate but at least they wer movie. You said they weren't and I corrected you. I didn't really get to finish my last post cause I had to run out to the bus. Kid got home early... anyway... I was saying all five of the original Dinobots got movie toys though not all of them were in the movie. So there are non-movie Dinobots that still have movie toys and Non-G1 Dinobots that still have G1 repaints. Two versions of every Dinobot regardless of being or not being in the movie. And I believe the G1 colored versions were convention exclusives that came with an Ark play set though they may have also been avalible individually without the play set in those colors as well. Not entirely sure on that one. Even the movie versions aren't really screen accurate because Hasbro aperently thought they were too boring looking and gave all the toys brightly colored paint jobs rather than the bland grey they appear in the film. Grimlock is kinda close to his movie colors except for that bronze. Anyway... as for Shadow Raider.. again not really the point. You claimed the Studio Series toys all had to be screen accurate. Shadow Raider isn't. He may be in the movie but the toy is still completly inaccurate to what appears in the film. Also would like to point out that the Gold Bumblebee's even if they were convention exclusives, they're still part of the Studio Series toy line. So I'd say a G1 colored Blitzwing isn't entirely unlikely... it's just like any other movie toy line. The only real difference between Studio Series and other movie toy lines is that it's got figures from all the movies not just one specific movie. It's not really about being movie accurate all the time which is kind of impossible with these designs anyway. Don't forget there's also tripple changers who can't tripple change in the Studio Series toys... and the combined mode for Optimus and Jetfire has a rediculously over sized gun that's not accurate to the movie. RotF Megatron is still largely inaccurate. They always seem to be either an accurate robot mode with a inaccurate vehicle mode or the accurate vehicle mode with an inaccurate robot mode. They never get both modes right. WW2 Bumblebee has the wrong vehicle mode. It's a cool vehicle that would have existed at that time but it's not what he transformed into. I don't know where you got this idea that Studio Series had to be screen accurate. Guess there's no convincing ya then. You do you then. Saying Shadow Raider is a character from the movies is a bit dishonest. The toy is a retool of Lockdown with a new head that is still Lockdown's head and a new weapon that is still Lockdown's weapon, it's just named after (but has nothing in common with) the unnamed-in-movie mooks that were hanging around Lockdown's ship. Ultimately it doesn't really matter, though... the Studio Series' dedication to screen-accuracy was thrown out the window by Thundercracker, then again with Shadow Raider and then was finally shot dead by Crankcase. - The San Diego Comic-Con 2014/Hasbro Toy Shop exclusive "Dinobots" 4-pack with Ark playset (Grimlock, Snarl, Slug and Strafe), branded simply "Transformers", missing Slog. - The single-packed Amazon exclusive Voyager Class Slog (Sludge), branded "Age of Extinction", completing the team. - Then later, the Platinum Edition Dinobots 5-pack (Grimlock, Slog, Slug, Strafe and Snarl), the whole team in one set, but now with new, more "G1"-esque head sculpts, branded "Generations". WW2 Bumblebee has the wrong vehicle mode. It's a cool vehicle that would have existed at that time but it's not what he transformed into. I don't know where you got this idea that Studio Series had to be screen accurate. WWII Bumblebee has his own design working against him. His transformation makes no sense, so there's no possible way to give him a screen-accurate robot and vehicle mode unless it involves huge amounts of fake kibble. His robot mode explicitly sports kibble clearly based on a Humber Scout Car (an armored vehicle used by the British forces), yet somehow he manages to transform into a regular, unarmored Mercedes-Benz cabriolet. Even though chances are Hasbro wanted to avoid potential trouble for having one of their main good guy toys turn into a Nazi vehicle that might cause an uproar when being sold in Germany, that still doesn't excuse his Studio Series toy, though, since it turns into a Humber Light Reconnaissance Car, making him inaccurate not jut to his onscreen alternate mode, but also to his onscreen robot mode kibble. Some of my in-hand photo. 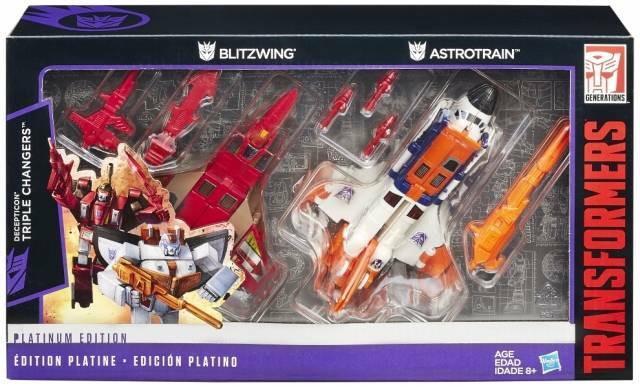 You're never going to get me to believe this was Blitzwing from Day 1. This guy was absolutely Starscream until something changed last minute at Hasbro. They couldn’t kill off Starscream before the 2007 movie in the timeline. It’s half prequel, half reboot. Transformers have survived worse than being blown up before. Including Starscream. He came back from literal death. Repeatedly in one episode of Animated. Even in the nonsensical Bayformers continuity we've seen Transformers have survived worse than this. It would give Starscream a reason to have a rivalry Bumblebee in future movies, should the next director have the braincells or desire to follow thru with a story device like character development.